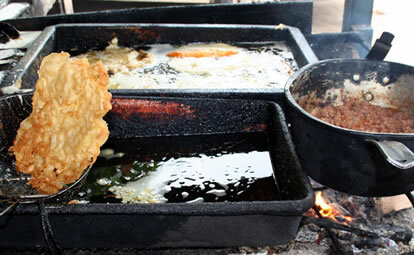 In Culebra you will not find as big a variety of Criollo cooking as in San Juan. But you will be able to taste some very typical dishes in large quantities! The staples like empanadillas (crescent-shaped turnovers filled with lobster, crab, conch, or beef), the ubiquitous frijoles negros, tostones, platanos maduros, asopao (gumbo style soup made with either chicken or shellfish), carne guisada (beef stew), arroz con pollo, chuleta frita and pescado frito on the other hand are almost always available! Most places change their menus according to mood and availability. I suggest go there and try it out! For further reading I recommend 'Cocina Criolla' by Carmen Aboy Valldejuli, a must for every Puerto Rican kitchen. * Jugos Naturales de Culebra - All natural drinks made by Julian. Look for him at the plaza on Saturdays and Sundays. All drinks are made from fruit grown in his garden. The Guanabana drink is a must! * Kiosko el Terminal, across from the Ferry -They have natural juices, pastelillos and daily specials. * The Cafe at the airport, for early morning coffee.